MRTeam has been eagerly awaiting the completion of a 'Titan Custom Built Trailer'. The B Trailer Race Car Transporter is 45 ft in length and designed to comfortably take three cars, even four cars if necessary. 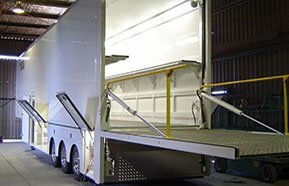 The trailer has been constructed using the latest design FRP body system consisting of 20mm fibreglass FRP panel side walls and a 30mm insulated fibreglass FRP panel for the roof. The nose cone is a mirror finish Titan Round Stainless front - simply stunning! Please visit our Custom Built Race Car Trailer Photo Album for our display of her highly anticipated arrival.